In the year 2018, technology is advancing in ways we predicted but also in a variety of unexpected ways. 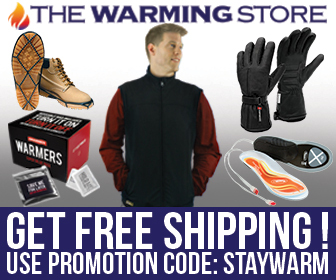 The addition of heated clothing and gear to the outdoor community is of course both expected and long overdue. 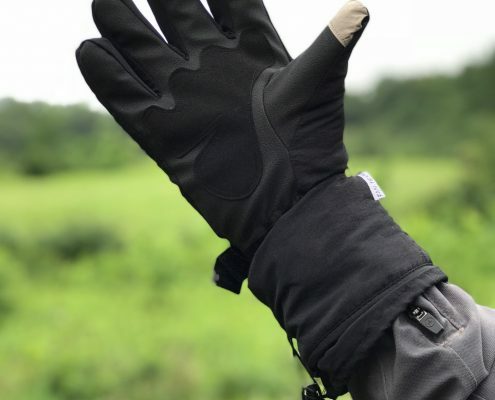 I had an opportunity to take a pair of ActionHeat 5V Premium Heated Gloves for a test ride. 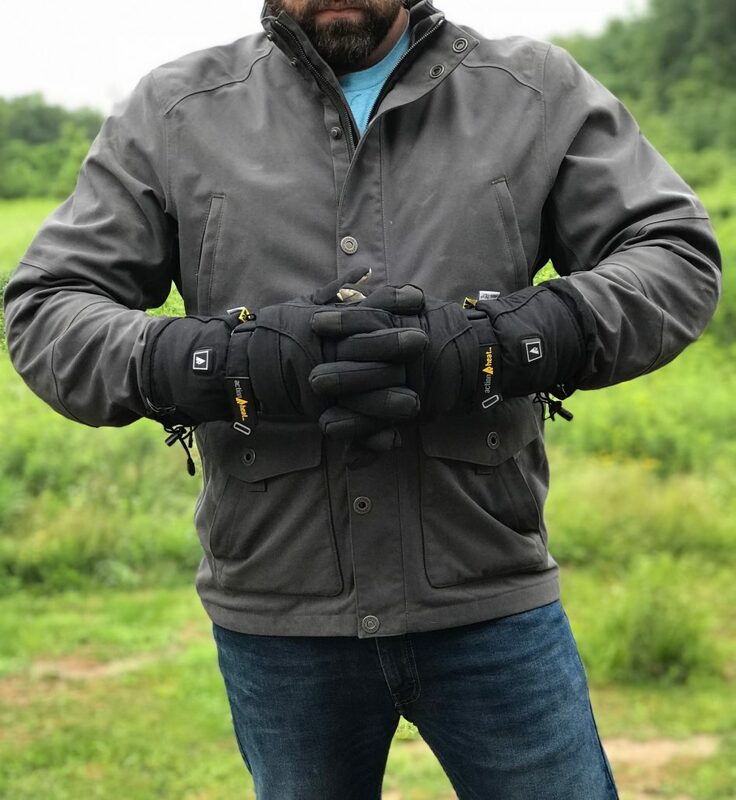 I was sent a pair of these gloves by my friends at TheWarmingStore.com. I must admit, I have built in sense of skepticism to any “heated” article of clothing. As a very young man growing up in Connecticut, I was constantly being warned and scolded for playing too closely to my grandparents indoor kerosene heater. This heater was placed in the kitchen of their houseboat for some reason and everyone was worried I would run into it or touch something dangerous. Those same grandparents were also fans of heated blankets. They were snowbirds, traveling from Florida in the winter to New England in the spring. So the early season nights could be a little chilly on a less than well insulated houseboat. Now this is the early 1980’s and technology was not what it is today. At the time, there were stories circulating about electric heated blankets catching fire while people slept. This of course was a huge cause for concern for my mother and I was more or less banished from using a heated blanket. It has been thirty years since these warnings were hurled at me, but needless to say, I bring a hesitation towards heated gear. Yet I also have great faith in mankind’s ability to advance and improve technologically. I was surprised by my ability to quickly embrace heated gloves. 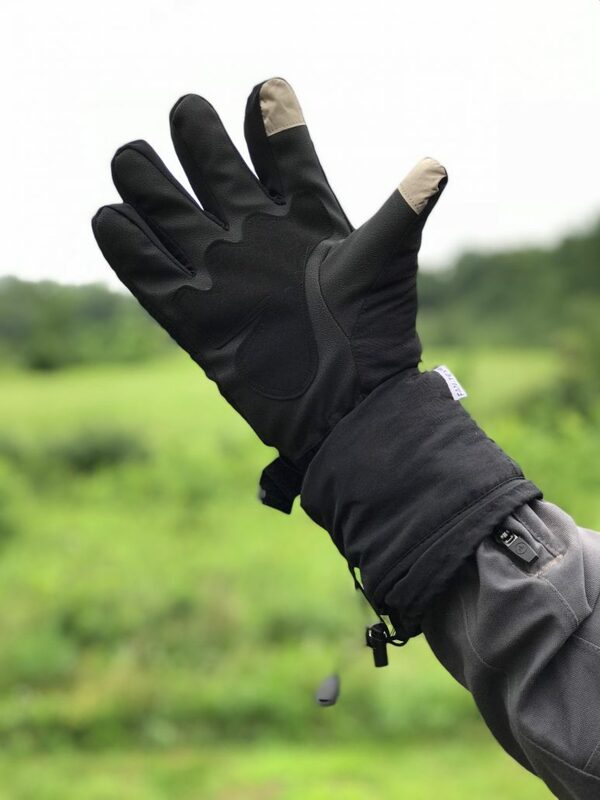 As an adventure motorcyclist, heated gear is embraced in some circles but is typically used in the form of heated vests, socks, or jacket liners. Many modern adventure bikes come with heated hand grips that help you manage your motor-functions in cold conditions. The nice thing about heated gloves like this one is their distribution of heat. 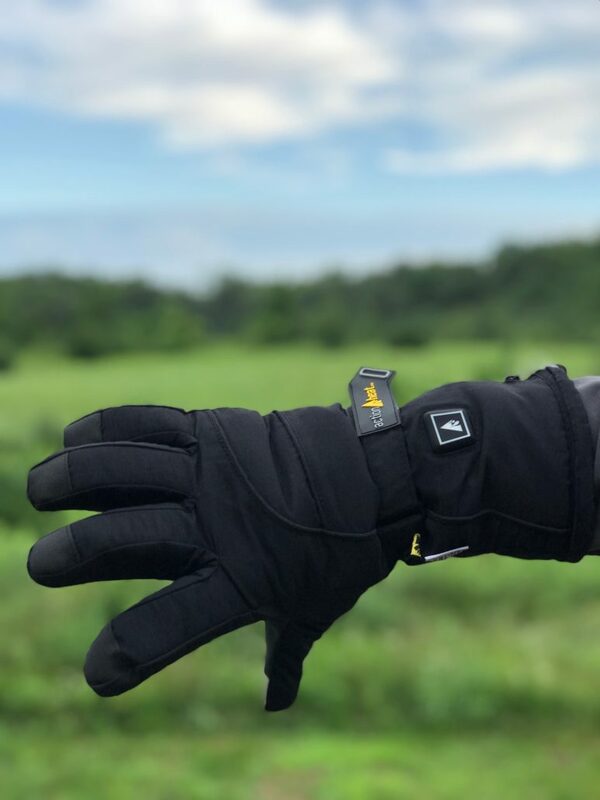 The fully waterproof glove insulates and also circulates heat through the fingertips where you need it most. It also reaches the top side of your hand where a heated handlebar grip will not. This is an obvious benefit compared to the focused palm heat you receive from the handle bar grip heat of your motorcycle. The heat is powered by a Rechargeable 5V 3000mAh battery pack that can be charged by USB in about 3 hours. On a full charge if you run the heat on high, you should get about 3 hours of heat. 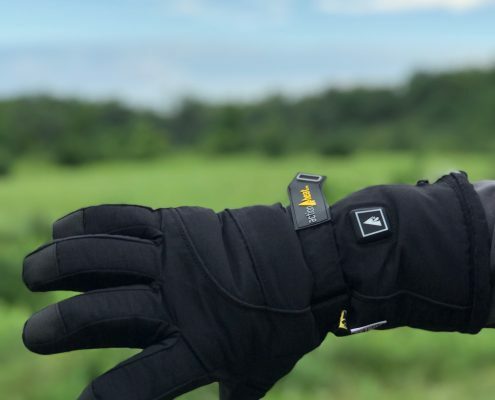 The gloves include a self contained battery housing that you will not notice while wearing them. If you are curious about what the heated gloves feel like, think of a heated car seat and the way it radiates heat gradually and distributes the heat rather than creating a hot spot. The overall dexterity is good but not great, but the insulation included would tip you off to that. Still the fingertip touch screen material offers usability where other heavy duty winter gloves will not. The ActionHeat 5V Premium Heated Gloves come from a line of heated gloves produced by the ActionHeat Brand. 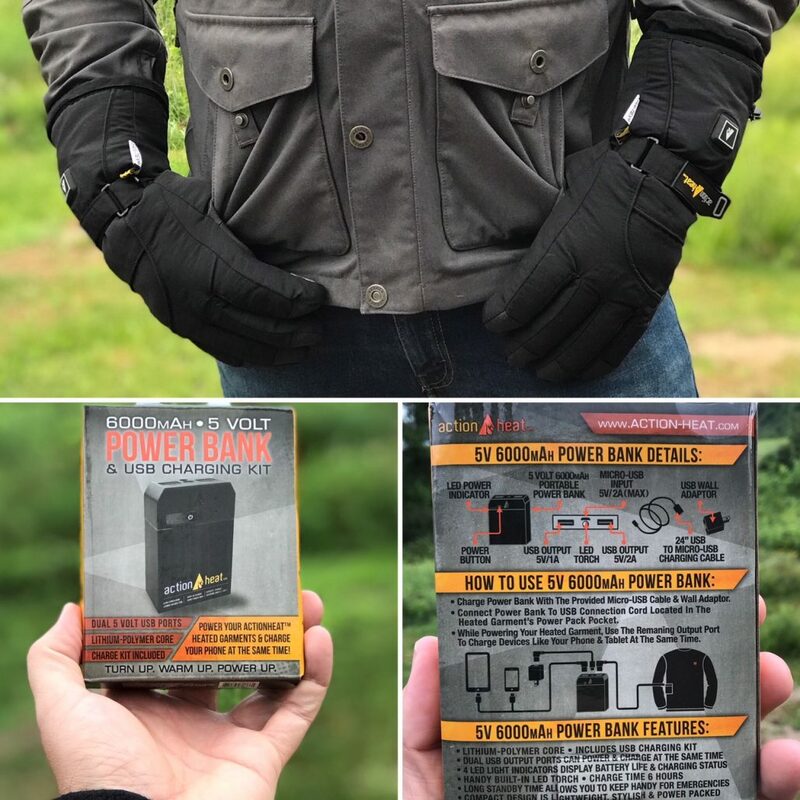 They come with an easy to use control panel and charging system that ensures your hands will stay functional even on the coldest of days. These gloves have found a place in my kit. They are best used to help facilitate outdoor activities or for attending cold weather outdoor events. You can purchase the ActionHeat 5V Premium Men’s Glove here. They run a cool $199.99 but I think you’ll find that the product will extend your ability to play outdoors. Hard to put a price on that. Check the main page as well for other styles and sizing options for women.